The Grenfell Inquiry has started answering its core question - how could this happen? It will take well over a year to answer. Today, though, we got the testimony of fire safety experts. This is only provisional but it raises questions that the government urgently needs to consider. Just a few weeks ago, Dame Judith Hackitt published a review of the building regulations. There were issues with it but the conclusions of her work are being challenged further. The first issue is the testing regime for cladding. The critical test for getting a design that uses combustible insulation onto the outside of buildings is known as BS-8414. You mount your proposed cladding system on a wall, then a scientist lights a bonfire beneath it to see what happens. I have noted my surprise previously that the use of this test has not been suspended while its validity is being checked over. Image caption Fire test rig used at the BRE in Watford, with reporter for scale. This picture shows the test rig for an 8414 test before the cladding is fully installed. The empty cavity at the bottom is where the fire is placed. The effect of suspending the test would mean you could only use insulation and panels that were functionally fire-proof while the test system was being assessed. This would be awkward - Brian Martin, a civil service expert official deeply involved in the response to Grenfell, was a co-author of one of the sets of specifications for the BS-8414 test. But there are problems with features of the test - their secrecy is a major issue. Companies can have, say, 10 attempts at passing a test. So long as they pass once, they can declare it is safe. Dame Judith's report falls short of calling for all tests to be published, which raises the potential for this type of gaming to continue. Furthermore, the Fire Protection Association, a fire research body run by insurers, believes that products are being passed because they're installed on the test wall with a level of perfection, care and fire-breaking that is not attainable in real life. People do not use as much riveting or fire blocking in reality. They also do not take days to install material on a small wall. Today, one of the expert reports commissioned by the inquiry recommended that the BS-8414 test be dropped. Professor José Terero wrote cladding facade systems "are of such complexity that the direct results from any of the relevant tests are not sufficient". Even if it were used correctly, the BS-8414 test regime does not provide sufficient evidence that a design is safe. Who checks buildings are safe? The next issue is supervision of approved inspectors and building control officers. These are the people who declare buildings as safe for use after construction or major works: approved inspectors are private sector, while building control officers work for councils. We previously revealed how NHBC, the largest approved inspector provider, issued guidance that would have permitted one of their inspectors to sign off Grenfell (though they say that they never signed off any buildings using that combination of products, and withdrew the guidance shortly after we reported on it). We identified 82 buildings fitted with the most dangerous combinations of materials, for example but we do not yet know who has been signing all these things off - or what else is being waved through. This end of the saga needs to be unpacked. We still do not know how this was allowed to happen. Litigation may uncover some individual cases, but not enough. 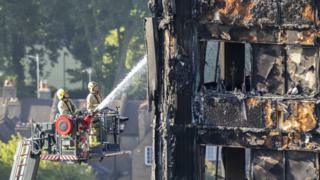 We will find a lot out about Grenfell - today, Dr Barbara Lane's report to the Inquiry stated that she found no evidence "that any member of the design team or the construction team ascertained the fire performance of the rainscreen cladding materials, nor understood how the assembly performed in a fire". So how did this get through the building control officers? We do not know. The building control officers at Grenfell, she says, were neither "informed nor understood" how the cladding would perform in a fire. It was their job to check, at the least, that a fire engineer had considered the design and concluded that it could be used safely. But her report implies other major errors by the building control officers. She also says the installation of the windows was dangerous. The firebreaks installed in the cladding were not fitted correctly. Fire doors were insufficient. These are not complex fire engineering questions. These are questions of basic inspection competence. Dame Judith proposes that a new body should take complex buildings away from approved inspectors or local authorities but, in the meantime, what are we to do? And if inspectors are not keeping a close eye on fire doors, for example, low standards in fire safety may be a problem that goes well beyond large complex buildings. We need answers. A year on, we are still finding questions.